There are many more examples of my work in the "gallery" pages. 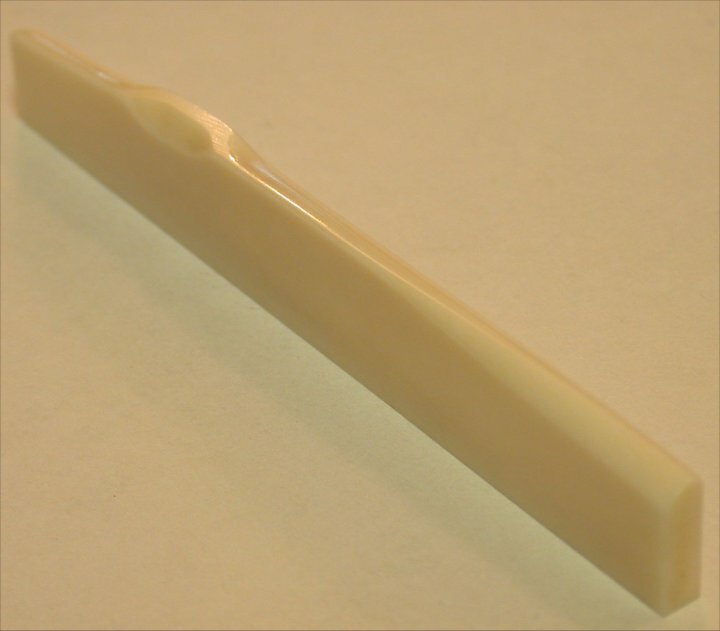 Bone is the most common and least expensive aftermarket natural material used for saddles. It is denser than any of the synthetic materials and in nearly all cases displays an immediate, noticeable difference after installation. Most of the bone used in today’s guitar saddles comes from Chinese cows or ox. Is a Chinese cow or ox better than American ones? Probably not, but their bones are cheaper. Additionally, there is no difference between the final product whether the bone came from one animal or the other. NO animals are unnecessarily murdered just for the purpose of anyone’s guitars. These are simply the byproducts of the beef industry. Nearly every guitar in the higher price range ($2000.00 and up) will come with a bone saddle and nut as the standard material. As I mentioned in the general information page, rarely if ever, will you find ANY hand made guitars in the extreme price ranges that do not come equipped with high quality bone components. It is unquestionably the standard in that section of the industry. 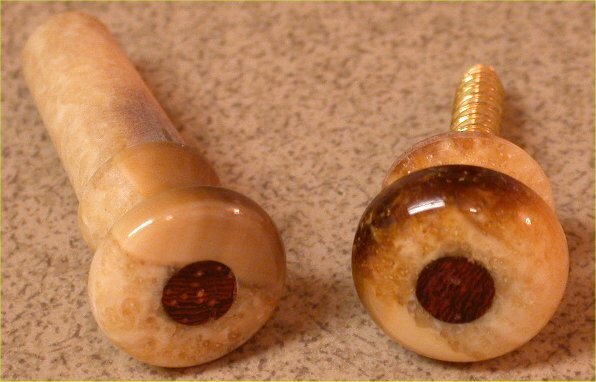 Bone saddles are a bleached white color, and can occasionally have some darker “speckling” in the grain. 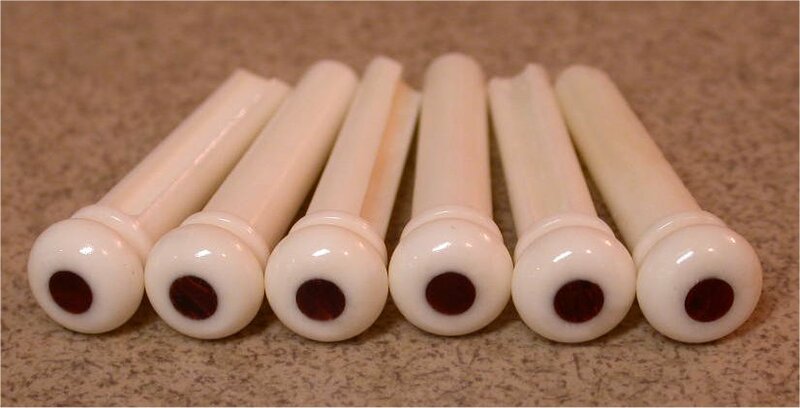 Most saddles can also be ordered in what is known vintage bone. 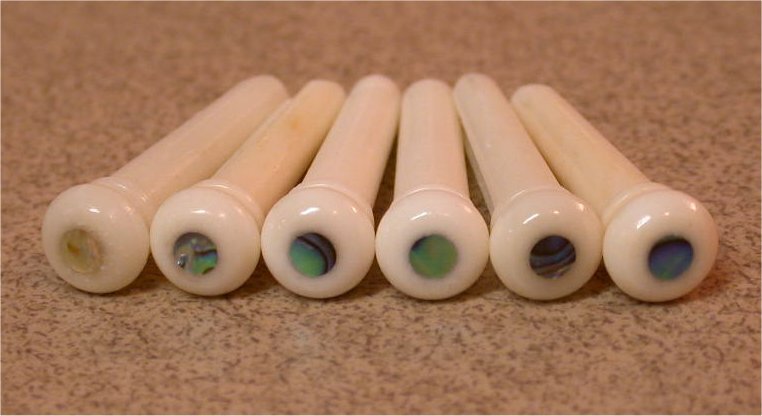 The only difference between this and regular bone is the vintage bone is dyed to a "baby poop" yellow-brown color to give it an aged or vintage look. Bone is usually the first step people choose in an aftermarket saddle, as it is relatively inexpensive, and offers significant improvement over factory-installed components. Bone increases clarity and sustain, provides better overtones, and provides a better high to low end balance. It provides a much more “focused” high end and punchier low end, and is not at all shrill like some plastic saddles render the guitar. 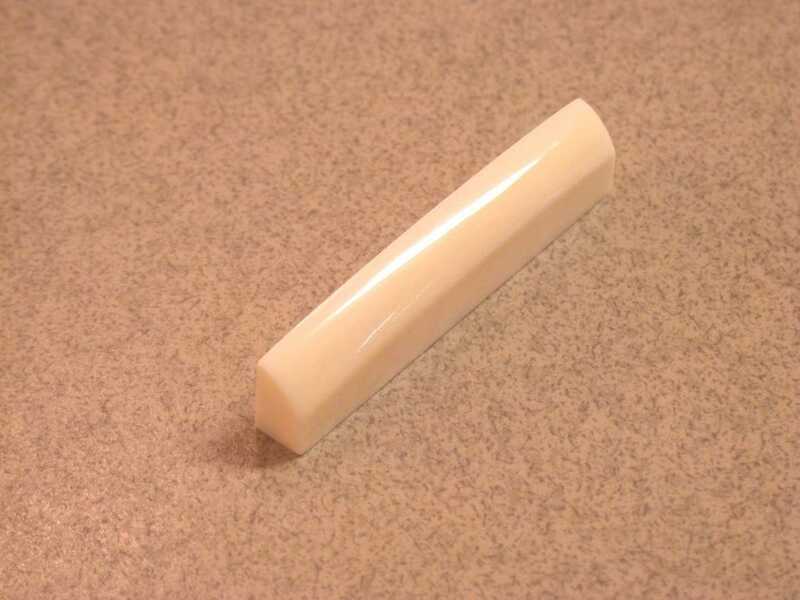 Additionally, bone will long outlast the factory installed plastic saddles. All the saddles I carry are listed on the pricing/ordering page. If yours is not listed, I can copy it (in nearly every case) out of any of these materials if you can send it in. New bone long saddle made from hacked up original. Definitely an improvement! Click on select images to see an enlarged view. Click on any of the thumbnail images to see an enlarged view. This is the hardest material that falls into the usable spectrum of densities for an acoustic guitar and is the ultimate material for maximizing the harmonic and overtone content of the instrument. 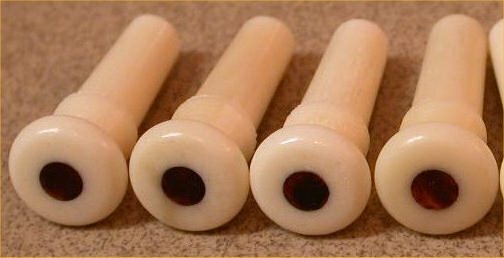 For this reason, West African hard ivory is by far the most popular material used by fingerstyle players or those who simply want the best high frequency response and clarity. 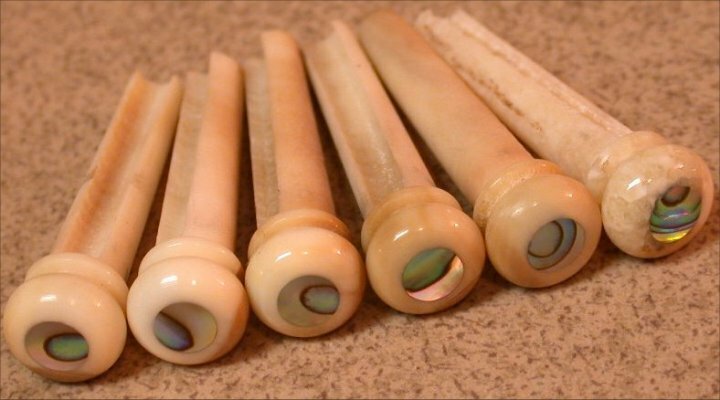 Sonically, it is the same as the fossilized walrus ivory, although being slightly harder, it is somewhat better for wear and tear. 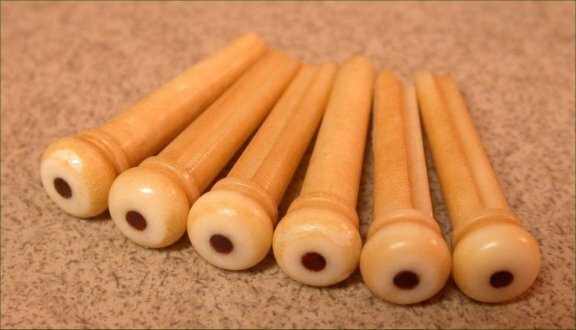 Personally, I feel this is one of the best natural materials I have used for guitar parts and the material I use in nearly all my personal instruments. Reminder.... I cannot legally ship Elephant Ivory outside of Georgia! There are a lot of myths and arguments about the sonic effectiveness of the pins. Here's the truth. On some guitars, the pins have produced definable, measurable and unquestionable acoustic advantages. On others the results showed negligible difference. Most customers find "some" difference. In any case, you're putting a better quality, longer lasting, better looking component in your guitar. The most commonly found attribute of the pins is increased sustain. I always try to keep the most popular sizes in stock with as many inlay options as possible, but it's impossible for me to carry every combination. The pins are most commonly carried in 3mm or 4mm ebony, abalone, faux tortoise or NO inlay I also stock some custom double-inlays as well. 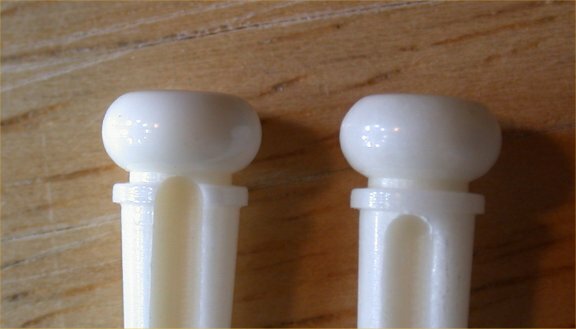 BONE BRIDGE PINS: A lower cost alternative to their ivory counterpart, although sonically speaking, they are identical. They are fairly unassuming in appearance, but still offer a nice improvement over factory-installed plastic or wood pins. I also make these in a "vintage dyed" appearance. These pins spend about a week in a dye that results in a pin that simply looks old. It's hard to make thousands of dyed pins that come out looking exactly the same, so there is variation between the sets.. from gently dyed, to dark and speckled and looking VERY old. Everyone likes something a little different so I'll be happy to let you know what I have available at the time, and send any pictures of specific sets if needed. There are always sets that don't make the final cut in appearance (both non-dyed and dyed), and I keep them aside and discounted as "factory seconds." There are usually a number of size 1 and size 2A pin sets in stock, and I'll be happy to let you know what's available, as it changes constantly. This is a convenient way to give some fully functional, ugly ducklings a home and save some $$! 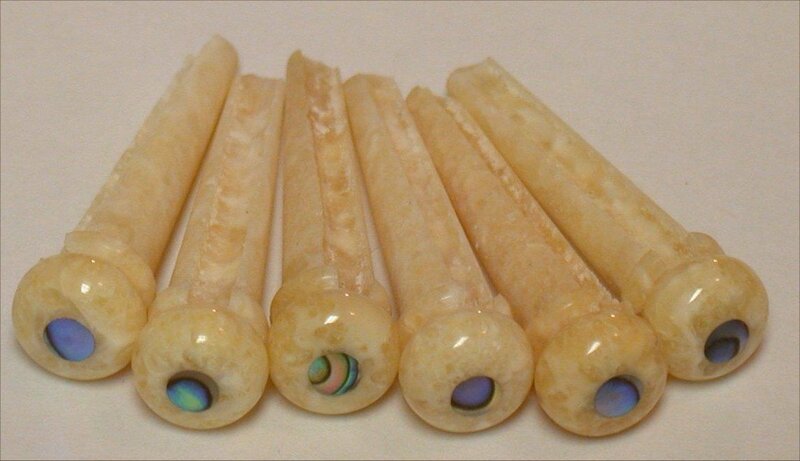 FOSSILIZED WALRUS IVORY PINS: The fossilized walrus pins come in a multitude of beautiful colors and patterns. I keep photographs of every set in stock, but do not keep them listed on this site as they come and go so frequently. Please let me know, and I will send you any pictures you need.. tell me what size too, so I send you the right pictures! One thing to keep in mind with this material is each set is unique and they come in MANY colors and variations. I get a lot of requests for matching saddles, nuts, endpins, etc. It's very difficult to always accommodate this, but I will do the best I can to get you the best match possible. 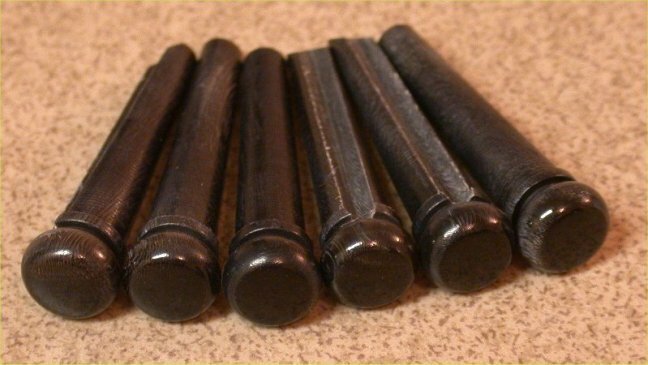 BUFFALO HORN BRIDGE PINS: Buffalo horn pins are more dense than ebony or plastic pins, but not as dense as bone or ivory. 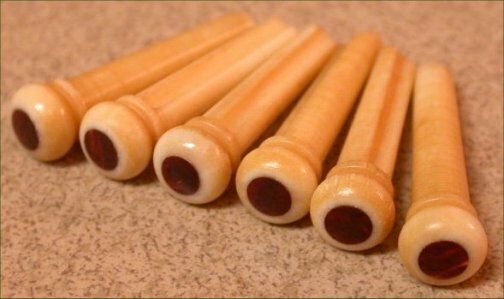 Buffalo horn pins are great for someone who really does not want to change the appearance of a guitar normally equipped with ebony pins, in that the buffalo horn is black. You probably won't find a big sonic difference, but they will outlast factory installed components, and look darn nice as well. Contrary to popular belief, these pins are not "bowling ball" black. They are indeed black, but have wisps of lighter grain through portions of the material giving it a very natural look. 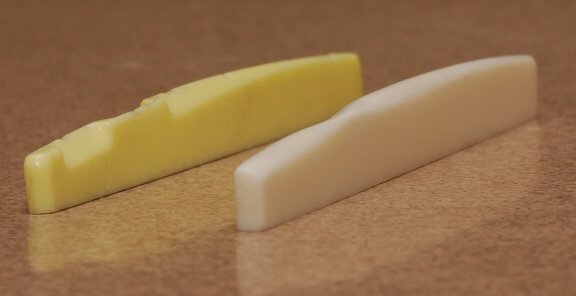 *A note about bridge pin fit and proper sizing! My pins are sized for the maximum size found to fit your guitar. I have to size the pins in this manner as all instruments are slightly different. 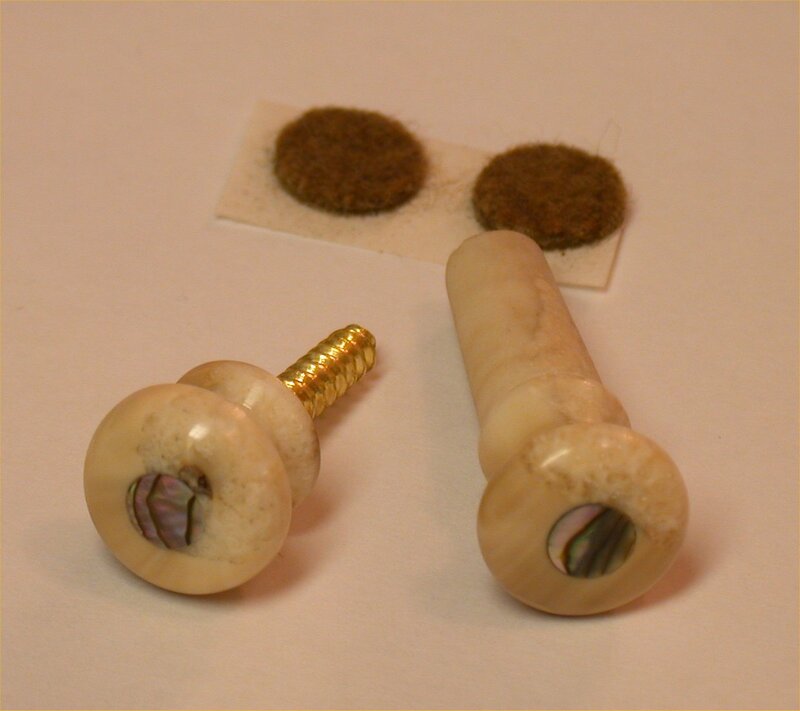 These may require some sanding of a few thousandths along the stem to fit them perfectly to your pin holes. 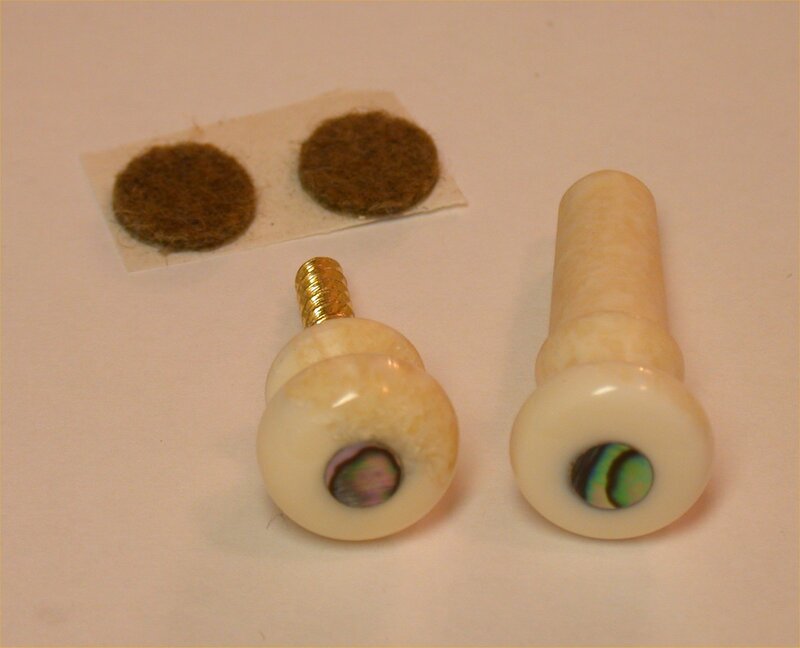 Reaming the pinholes to fit the pins is for some, a better option, and results in the best fit. Bridge pins come in billions of sizes. Well, it's not that bad, but there are quite a few and unfortunately I can't carry that many sizes in stock. 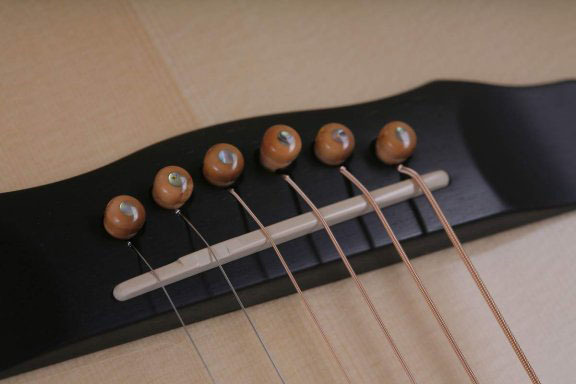 Luckily, many of the larger manufacturers such as Taylor, and Martin use a standard size bridge pin. Some of the smaller makers do as well. 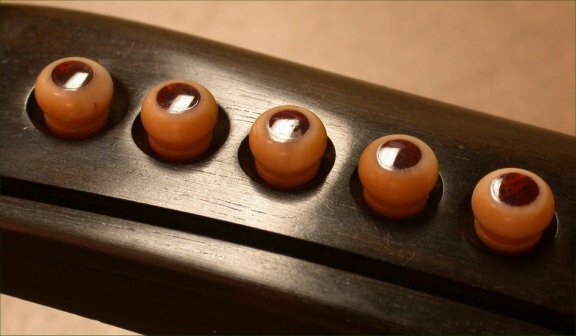 Some manufacturers use different size pins on the same guitars. For this reason, I have developed as best I can, a sizing chart for many manufacturers as shown below. 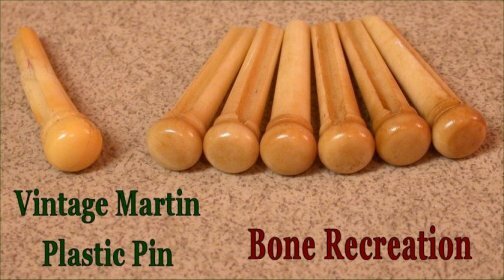 - These are designed to replicate a naturally aged pin. Designed to look OLD! 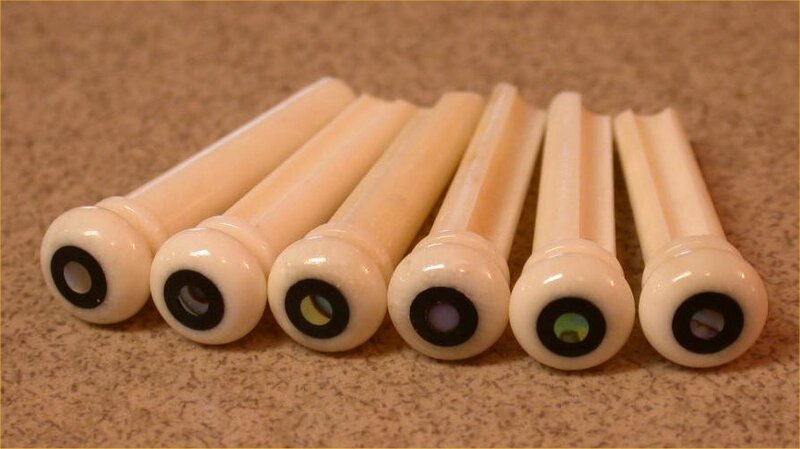 - We have matching saddle and nut material for the traditional "vintage bone" color, shown in the center picture. - Call or email for pics... the inventory changes constantly! - Prices range from $37 - $49 Sorry...no custom sizes! - These are all one-of sets. Designed to look unique and/or match up to a top-color! - Two "basic" color patterns: Amber and Brown + many different variations! 2A Authentic 5 Degree .230" No For newer Martin Authentic series or oversize for other applications where a larger pin is required. * I am discontinuing and slowly phasing out the size 1 pins. The only difference is the size 1T has the slot cut through the skirt, which is there to avoid string interference. If you don't need the slot and have it...it is irrelevant and makes no difference in terms of fit, as it is the same size pin, so the 1T will work on any guitar that requires a size 1. Plus, it will allow me to keep a larger inventory and better selection of size 1T pins. Epiphone various Need measurements as shown in diagram below. Gibson Size 1T, 1.3T, or 2A Need measurements as shown in diagram below. Huss & Dalton Size 1.3T Occasionally I'll find a size 1T on these, but not all that often. Martin after 1994 Size 2A Will require some degree of fitting, particularly on newer models. Pins stick up from factory... so do mine. What size pin do I need? How do I measure them? Good Question! Many guitars, as listed in the above chart use a standard size pin. In that case, life is good. 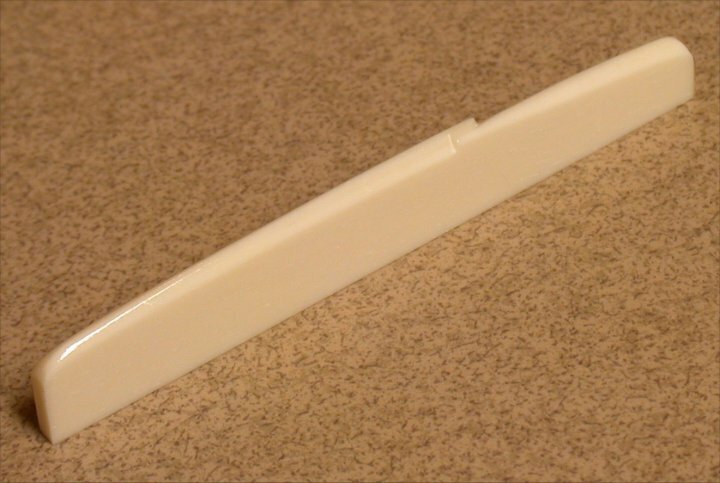 On the other hand, many manufacturers use varying sizes of pin, and often order pins in bulk, simply fitting what they get to the instrument. In this case we need two points of information to get you the correct pin, or make you a custom size if necessary. To take measurements accurate enough for a correct fit, you'll really need a dial or digital caliper for step 2 of this! 1. Is the pin slotted and does the slot continue through the skirt or stop below it? 2. 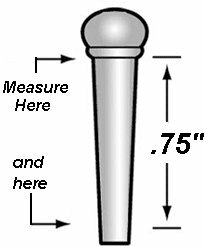 Measure the diameter of the pin in 2 locations. #1 directly under the skirt, and #2 at a location 3/4" below the top diameter measurement. As mentioned above, it is IMPORTANT that these measurements be done with a dial/digital caliper, or other device that will give you the dimension in decimal form to the thousandth (.210" for example). This will give us the size of the pin as well as the ability do some math and figure out the taper angle. Lastly, PLEASE ensure your measurements are correct ! If in doubt, it's always best to make them slightly oversized and fit them to the guitar. I can manufacture nuts out of any of the abovementioned materials. 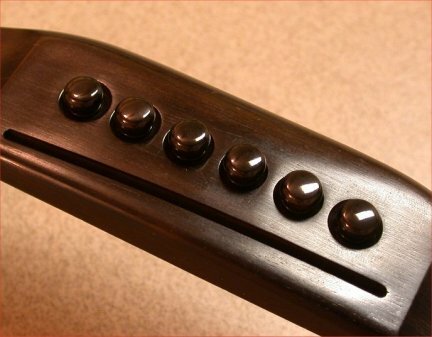 In nearly all cases, the effectiveness of the nut in changing the sonic qualities of your instrument is negligible, although there are certainly a number of circumstances in which you may want to install a new nut on your guitar. 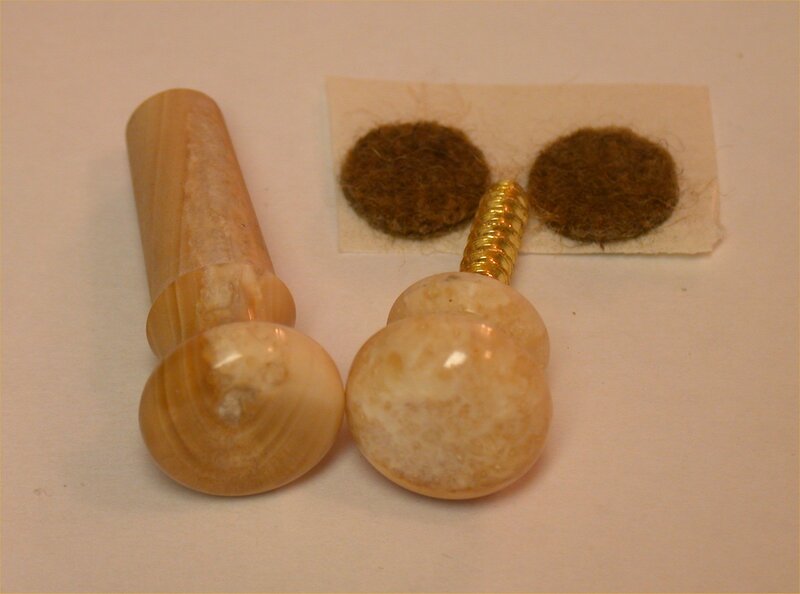 As I have pointed out in other areas of this website, it is my strong recommendation to have your nut installed by an experienced technician or luthier! Installation of a nut requires a certain degree of experience as well as specialized tools. Even if I construct an EXACT duplicate of the factory-installed nut on your guitar, there will still be a greater degree of “finish work” as compared with the saddle. Nuts come with the final shaping done, but oversized and with the string slots uncut. 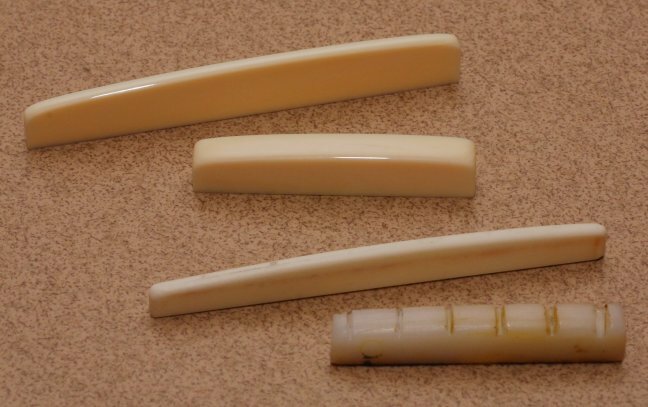 I carry the standard, 5 degree tapered endpins (.310" underskirt diameter) and strap buttons in elephant and walrus ivory as well as a limited selection in bone. I have a number of inlay selections for each material, and current photographs of the elephant or walrus sets are always on hand for your review. Click on any of the images to see an enlarged view. The picks now have their very own page!